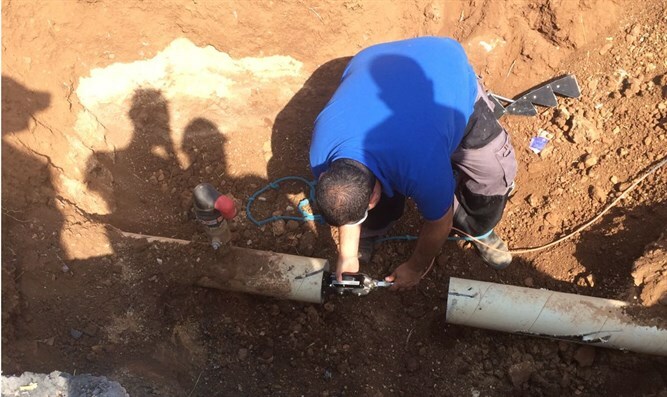 Mekorot water company, Civil Administration disconnect illegal Arab water pipes stealing water from Jewish towns. Will it last? The Civil Administration's Water Division and the Mekorot water company on Thursday morning carried out an enforcement operation in the Arab town of Jalud, which was stealing water from the nearby Jewish town of Migdalim and its neighbors. Jalud is located near Shechem (Nablus), in Area B of Judea and Samaria. Areas A and B are inhabited by Arabs, while both Jews and Arabs live in Area C. For security reasons, both areas B and C are under Israeli military control. Jews cannot enter areas A and B (or any Arab town) without a security detail, if they wish to remain alive and unmolested. However, both Arabs and Jews live and wander freely in Jewish towns. The water thefts were carried out by building illegal water pipes attached to the Mekorot water pipes, diverting 35 cubic meters per hour. During the operation, six pirate water pipes were disconnected from the Mekorot pipes. "The Civil Administration works to ensure proper water supply to all areas of Judea and Samaria," Civil Administration Water Division Deputy Commanding Officer said. "We are currently working to restore the town's water supply as quickly as possible." "We will continue to enforce the law, despite the repeated attempts to steal water. The Civil Administration is currently working on several plans which will not only regulate the water supply, but add to it as well. For instance, we have several plans for the town of Shiloh (in central Samaria), which will increase it by thousands of cubic meters per day." Additional water lines are expected to be added to the town of Maaleh Levona as well. Other plans include the operation of the Ariel, Jericho 5 and Booster water wells, which constitute an additional 19,000 cubic meters of water per day for the residents of Judea and Samaria. Water theft is a large-scale problem which harms Jewish farms as well as residents - and provides free water to illegal Arab farmers.